Looking at your precious new addition you may or may not notice anything out of the ordinary about their appearance. Your pediatrician however likely knew instantly when they saw your baby that something was different. They have been trained to pick up on these sometimes subtle differences. A syndrome is characteristics that are consistently found together. Frequently this is associated with a change in genetics. Down syndrome was “discovered” by finding consistent features and physical characteristics that were consistently together along with a mental disability. The features listed below when present alone do not indicate Down syndrome, but when found together suggest this diagnosis. 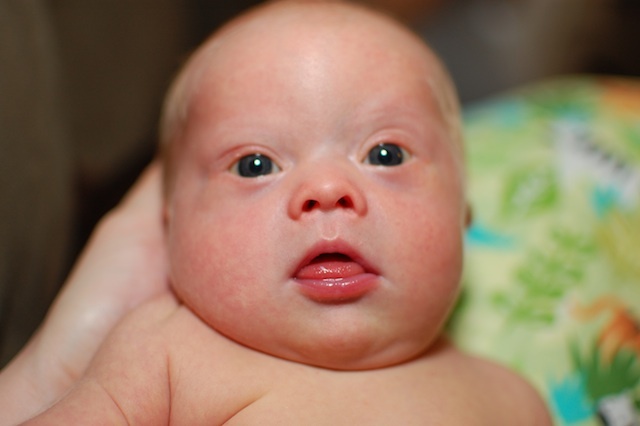 There are several other Down syndrome markers at birth, but the ones I’ve listed are some of the easier ones for new parents to pick up on their own. I am including the pictures that I used to diagnose Noah. There were two pictures specifically that I saw in the delivery room and recovery that I am fairly certain convinced me that Noah was born with Down syndrome prior to holding him in my arms. In Rick’s version of Noah’s birth story he is unaware of my concern as I kept this to myself until my pediatrician came to confirm my fears. Isn’t it cute that he sticks his tongue out like that…. The outer corner of the eye will be turned up rather than down. This is sometimes referred to as almond shaped eyes. The shape is also very similar to that of someone of Asian descent. This will likely be the most predominant physical feature of Down syndrome as your child grows up. Looking at your baby from the side there will not be much curve from the nose, cheeks or mouth. There is also not much shape to the cheeks when looking at the baby from the front; the cheeks seem to hang on the face. This is due to the poor tone in the muscles of the face and is actually a characteristic of hypotonia rather than a true Down syndrome marker. You can see below that there is not much definition to Noah’s face and his cheeks are just kind of hanging there. He frequently has his mouth hanging open as well with his tongue sticking out, which brings us to the next feature. There will likely be many speech therapy appointments to help your child with Down syndrome keep their tongue in as well as work on speech development. He may be teasing you in this picture. People will tell you the single palmar crease or simian crease is the hallmark physical characteristic of a child born with Down syndrome. It’s a single crease across the palm of the hand. Despite the theory that this is so common, only 45% of children have a simian crease. The absence of this physical characteristic doesn’t mean that your child does not have Down syndrome, but people (including yourself) will try to convince you otherwise while you await testing. Noah is part of the 55% who does not have a simian crease. This is again a result of hypotonia as the hand was not held in a tight fist while he/she was growing in the womb. You may have noticed a theme above that several of the features are from hypotonia and not actually a distinct physical marker of Down syndrome. Hypotonia will be the biggest challenge the first few years and will be the reason for your frequent therapy sessions. You have to feel hypotonia; it is hard to diagnosis from pictures. The minute I held Noah in my arms I knew that he had hypotonia. Your baby will feel floppy or limp. When you hold him or her, it feels like they are going to slip through your hands or arms. If you lay them across your hand, they will look like a wet noodle rather than being able to hold their form. This will affect every muscle from face to ankles. Tummy time is your new best friend and child’s worst enemy as it will help your baby build head control and be the first building block for their development. You will also notice that when they are laying down their arms and legs fall out to the sides. See the picture on the left for an excellent example. I added a bonus feature in the picture with the footprint showing the wide space between the first (big) and second toe often referred to as sandal gap toes. Hypotonia even has its upside as your child will be a total cuddle bug and melt into your body. It is honestly the best feeling ever to have your little one snuggled against you. Rick and I fight over who gets to cuddle with Noah, so be ready to battle. Despite these features, I am fairly certain the majority of people are going to find your child to be the cutest baby they have ever seen. In fact, the majority of the population will have no idea your baby even has these physical features or even Down syndrome for that matter. In fact, I keep waiting for someone to ask if Noah has Down syndrome while I’m out and about, but no one has been brave enough to ask…yet. Please take a second to enter your email address below and stay up to day on all of our newest posts. This is a great post! A lot of people wonder how the doctors knew j had Ds and this is a great explanation. I remember before we knew for sure and before the Dr. even said they had suspicions we noticed j’s eyes and tongue but thought it was just him. My eyes are almond shaped, too…so it was very easy to shrug off. But it was always in the back of my mind. I just knew he had Down syndrome. Something that people always said and still do say (because they don’t know he has Down syndrome) is, “Oh my gosh, his tongue!! It’s so big/sticks out!!! How cute! !” I say the same thing now, “That’s because he has Down syndrome. 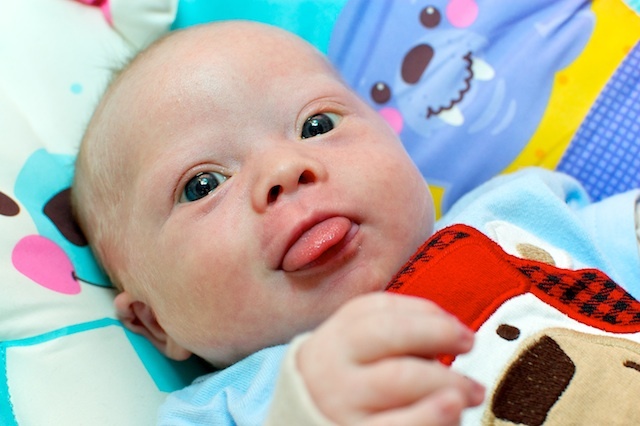 :)” Before we knew he had Ds, it did bother me that I had no idea why his tongue did that all the time and people would always comment on it…I knew it wasn’t “right.” ANYWAYS! I’m rambling. LIke I said, great post!! My wife works really hard writing these, and I know she really appreciates comments like these. I learn so much from her…before Noah was born the only thing I knew about Down syndrom was what I learned from Corky from that old show, “Life Goes On”…ha,ha.. I go easy on them, since I know they don’t know better. And I’m pretty sure I’d said the same thing about 7 months ago! My grandson has a tongue that constantly protrudes. He doesn’t have Down ‘s Syndrome. His parents have taken him to their pediatricians and ENT and they just say he has a large tongue and will grow into it. He is almost three now with no change. I worry so much about him. Any suggestions? Hey grandma..My daughter is a DS case ,she’s now 7 yrs old.She had a tongue protrusion when she was a baby but her speech therapiest once told me to simply push it in. After a while it worked perfect.. Thanx to her & to God . You can give it a try.. I have been googling like crazy and came across this blog. My sister in law who lives in another state sends us pictures of her newborn very often. We also welcomed a baby in the world 10 days prior to her. Her little boy was 8 weeks early. Since he was born I have noticed what I believe to be physical charecteristics of Down’s. I was waiting to hear if anything has come up during his visits with his pediatrician, but so far nothing. I don’t want to overstep my boundaries, but I also feel the need to say something because of try possible underlying health concerns. My oldest is affected by autism and I remember when a friend of mine brought the issue up. It wasn’t easy. Three years later I brought the autism issue up with my brother who’s son was diagnosed after I voiced my concerns and that was a situation of anger and hurt feelings that I don’t want to begin again. I know if I move forward with this then I need to tread lightly. I was wondering if you could email me and I could share the pictures that point to my concerns and tell me what you think. Almond shaped eyes are dominant in our family, as are curved pinky fingers in my hubby and my boys. My daughter just has the almond shaped eyes. On just about all of the characteristics many of them occur in some of my family members. He does have the Simian crease. I was 39 when he was born and the nurses wondered how old I was, I guess be cause of their suspicion that he had DS. I told them my age and asked what it was to them. I always knew that I was in a high risk category. My doctor was really nice to me because he encouraged me to have more children. I didn’t detect movement until I was about 6 months along. I think that must have been due to low tone too. I am rambling too. You are OK just need to keep speaking your mind kids that are born with a disability need help not a parent in denial my wife s friend has 2 kids both with down syndrome they are totally the cutest kids I’ve ever seen ? Hi Rick! Does Noah have the sandal gap toes? 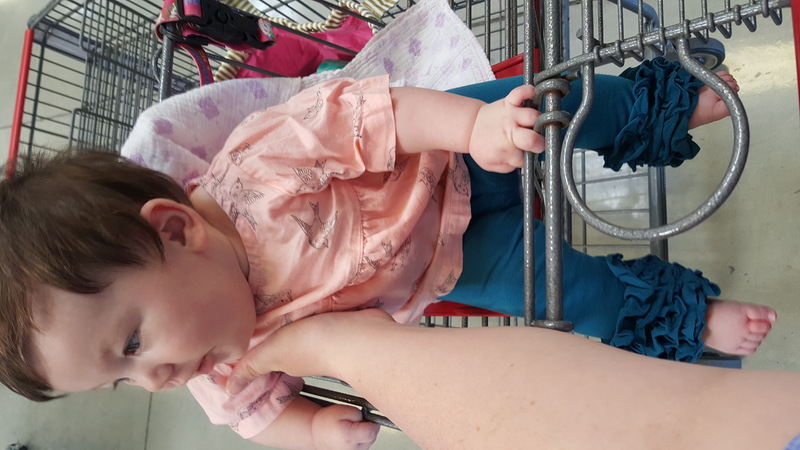 That was one of Ellie’s big features at birth (along with the eyes and hypotonia) and even though I think her feet are PERFECT for flip flops, Ellie disagrees. Great, informational post. Look at the picture for hypotonia and the label on the clear basket you can see Noah’s sandal gap toes imprinted on there 🙂 Pretty cute huh? I love the toes! 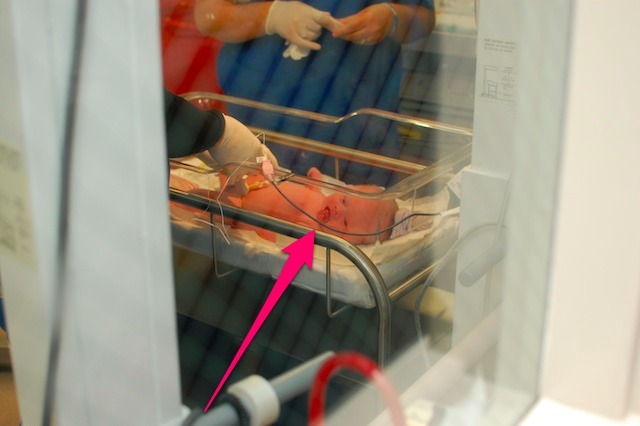 Once while in the NICU (my son was there 42 days)…they had to put an IV in his head…well of course I flipped O-U-T!!! But his nurse (who was like another mother to him) wrote me a poem from Nicholas and signed it with his foot prints. I have it framed and on my dresser…I look at it everyday! I don’t know what sandal gap toes are. I think I just figured it out. Timothy’s toes were webbed together and he had his toes separated and skin grafts. Great post, I wish your wife would have been the one presenting us with news our daughter had down syndrome, I remember when Anna was born she was not crying and I kept asking if she was ok and my husband kept commenting on her tongue. :). One of the other characteristics Anna has is the extra skin on the back of the neck. Noah’s mom, thank you for all the valuable medical information you are psting, it has really helped me to understand what is going on with my daughters body. It is my pleasure! I feel there is a common theme among family stories learning about a diagnosis that their doctor’s may have not done the best job. I am hoping that I can help the medical community for one celebrate the lives of children with Down syndrome rather than treat it like an illness. Let me know if you have any specific questions you would like answered. Thank u for the concern.my major problem is ,my DS daughter is playing with her stool.how do I stop her. I too have a beautiful boy with DS. To say he is the light of our family is an understatement. We discovered he had DS about 10 minutes after he was born. The ob/gyn came and put her hand on my arm and softly said, “I just want you to know I think he has Down Syndrome.” I really appreciated her gentleness. It took me about 5 minutes of blank thought before I realized that it didn’t matter at all to me. I had seen his wonderful, short little hand pop out before I saw any of the rest of him and I was hooked. He is 3 years old now and my main struggle has been deciding not to send him to preschool for one more year. He needs me and I need him and we just aren’t ready to part from each other, even if it’s for a few hours in the morning. He is the only baby I have seen that came out with long, white hair. I call it his halo. His hair is still as white as it was when he was born. He gets a lot of stares when we got out but I know it’s because people just can’t believe how adorable he is. The clerks at all the stores I shop in know me because of him. If he’s isn’t with me on rare occasion they always ask where he is. I love it!! what a sweet story! I chose the name Nicholas for my son, it means “warrior”…and I figured coming into this world with a heart defect, and Down syndrome, he would be in for the fight of his life. I used to whisper to him (in the NICU), “if you fight, I’ll pray)…we still do it! Cynthia… What a beautiful story about your precious Matthew. My son is two years old now, he also was born with DS. His name is Mateo, this is Matthew in Spanish! Indeed, both of our boys are gifts from God! Thank you for sharing your story! Thank you for this, it was fabulous. We knew before Oliver was born that he had DS, and we knew he had a heart defect that would require surgery. I wish this site would have been available then. But Oliver is few months older then Noah. It was amazing when people finally were able to see Oliver how surprised they were. I am not sure what people expected to see. They fell in love instantly and kept saying how adorable he is, well duh he is adorable! It really put into perspective for me that people do not know or understand Down Syndrome anymore today then they did years ago. But because of the two of you and this site, that will change and has already changed. I wish every family could have an Oliver or Noah, and I know this world would be a better place. We are better people for knowing Oliver, and his sister will be a better person for having this amazing brother and what he teaches us every single day. Thank you both for so much! You are doing amazing things, I hope you realize how much this site means to us parents of these kids. We needed a place to share our kids and brag. No judgement, just complete understanding. Thank you so much. I was glad when someone saw his beautiful almond-shaped eyes, cute little tongue poking out, and constant cuddling! I wonder if it’s just from years of being around children with DS, but when I saw the above pictures, it was very obvious to me. And yes, kids (and adults) with DS are some of the CUTEST I have ever known! My daughter’s syndrome is different, but it does have definite physical characteristics that most often go with it. She, too, is a super cute bug! Do you work with children with Down syndrome? reading your comment just now about the simian crease realy rang home for me. when paul was born the first person i saw ih him was my then 14 year old daughter morgan. since pauls birth and dignosis of ds i have found numerous similarities between him and morgan (including the simian crease). morgan has always struggled, being later to walk and talk and has quite a few learing problems just to name a few. i am currently in the process of having her seen by pauls peadiatrician to hopefuly have genetic testing done but i wont be surprised at all if i am eventualy told that she infact has ds as well. all i know is i am hanging out to finaly get some answers and be able to a wonderful 16 yr old girl who up until now has sadly been lost in the system getting little or no help throughout her schooling. Grandma (me) got to keep our little Rhett all day yesterday and all night. His Momma came to get him around noon today. This little guy is the love of our lives! Prior to his birth, a year ago last January, all I knew about DS was from when I was in high school and the state school would bus the “mongoloids” in and partner them with high school students to do Christmas shopping. That was in the late 60’s. When Rhett was born, I was in the delivery room and I knew immediately that he had DS. I was so concerned, not only about Rhett, but his Momma and Daddy too. Rhett stayed in the NICU for 6 weeks primarily because of blood sugar issues. (My daughter’s OB/GYN did not diagnose gestational diabetes and Rhett’s blood sugar was seriously low. Tell me how that happens in this day and age!!) Anyway, my daughter was at the hospital morning to night, every day and I would go up every afternoon to sit with them. The cuddle time was amazing! My daughter immediately got involved with the Down Syndrome Partnership of Tarrant County and learned everything she could about DS and what was available for assistance. What a great group of people that has proven to be!! I accompany my daughter and Rhett to the “Mothers’ Night Out” functions as often as possible. By the time Rhett was finally released to go home, physical therapy through ECI (Early Childhood Intervention) was already scheduled. My family feels very blessed to have been chosen to be Rhett’s family. My heart hurts when I think of the children that were placed in institutions immediately upon diagnosis. Those families missed so many blessings, love and sweet smiles. We wouldn’t trade our precious Rhett for anything or anybody in the world. The one thing I heard from someone about people with DS is this, “They are as God would have us all to be: loving without condition, non-judgmental and happy”. Thank you, God, for your most precious gift of Rhett!!! My comment is totally unrelated to the 5 most common features. At the end of your blog you said that you keep waiting for someone to ask you if Noah has Down Syndrome. As the mother of a beautiful 12 year old girl with Down Syndrome, I have noticed that the only people brave enough to ask that question are other parents of children with Down Syndrome, people in special education or people in the medical or therapy field that work with other kids like ours. I used to get annoyed at people for staring but now I just let it go. I understand people are curious and if they really want to know, they will ask. Megan is good at striking up a conversation with just about anyone and I’ve learned to gauge when a person is uncomfortable with her and can usually distract her away from them. That doesnt happen very often though. Most people just fall in love with her. Its a blessing and scary all at the same time! Abbie, this post is wonderful and made me cry at the same time. I just knew as well that my James had Down Syndrome. Yes I waited for the Dr. before speaking of it, I was in shock. I love their feet, they are beautiful! James is the cutest thing ever and he is the best cuddler! It is a great post! Everyone’s experience is different. Will share ours if a different story helps new parents. We weren’t positive that our little one had DS when he was born but based on prenatal testing, the odds in favor of DS were pret-ty high… so we were ready, past any surprise or worry and just excited both for our new baby’s arrival and to finally know after months of stressful prenatal scans (including heart condition, etc) – so our eyes were peeled for the features explained above. Ha! And baby Jacob apparently was intent on keeping his secret a little longer because in the hours after he was born – we/they still couldn’t tell for sure!! No tongue sticking out, nice round cheeks, no simean crease…not great tone, but pretty good tone…his eyes and his profile were the only features that gave us hint of a maybe. Blessings come from all places and the nurse in the nursery doing a more thorough evaluation happened to have a sister with DS and is actively involved in the local parent support group ….she was beside herself with excitement that she thought she had a little DS baby in the nursery…(ooooo-ing and ahhhh-ing over him to no end). She was more sure than even the pediatrician that he did have it even though the features were very subtle…we trusted her more personal connection/understanding to what she was looking at and in the end she was right. I will never forget her (a complete stranger) sincere excitement and joy – it was amazing reinforcment for our resolve to not let an extra chromosome get in the way of our new baby’s welcome into the world! You are right. We haven’t had a lot of people ask us about Timothy. We have been brave enough to ask others. I have made new friends that way. People who have had contact with him love him to death. The other thing is despite the fact that he is 22, he is the only one of my children who willingly hugs me. He is always telling me how beautiful I am. He loves to greet people at church and tells the women how beautiful they are. He makes everyone’s day. You all have a lot to look forward to as your wonderful child grows up. Thank you Noah’s Mom for all the valuable information on DS. I am an elementary school librarian, newly retired. I love children & books (in that order)! Right now I am helping care for our new grandson (our son’s) and our new granddaughter (our daughter’s)…but once they are two, I will find some volunteer work. I really enjoy hearing about Noah and keep up with your posts each day. He is such a cutie and a real sparkler!!! I saw this on one of your reposts and while I don’t have a child with DS, I am an educator and have worked with kids with DS in the mainstream classroom. However, I wanted to tell you that this post helped me a lot. A friend of mine has a child who was born with an unknown condition (the doctors feel it is a syndrome, they just don’t know which one yet). Among their many symptoms is hypotonia. They are closing in on the 3yr mark and still struggling to sit up un attended and walk un assisted (and speak). Reading your post helped me to understand what their child goes through and how frustrating it must be for them to not be able to put a name on the condition, to have a support line like you, to be able to say “that’s not cute it’s…” and have to explain to every person they meet what their child’s diagnosis or lack there of is. I truly commend Noahs parents for putting this information on here. It is most informative and helpful for parents with DS children. I have a sweet great grandson (Hunter) who is DS, I have been doing a lot of reading on your website in regards to DS. Thank you again , as it is so good to know what its all about and what may lie ahead. As to asking if your child has Dow syndrome, I asked a couple at the grocery store if their child had Down syndrome and they said “no” in a rather panicked voice. I have learned not to ask the question – I say “Oh what an adorable baby, I have a little girl with Down syndrome but she is home right now”. It opens the door but doesn’t say what I’m thinking too clearly to freak out parents. It turns out I got to know the mom a couple of years later, her son did have Down syndrome, mosaic type, and her doctors hadn’t figured it out yet. My comment led them to go in and demand that their doctor check for Ds, so they finally knew what was going on. She was grateful for my stumble, her son was about 6 months before he was diagnosed. When my son Isaac was born I saw the eyes and knew. My husband on the other hand didn’t see it or want to see it. The doctors came into my room and said alot of fancy words and then said we believe your son has down syndrome. I didn’t hear another word after that but I know the doctors were still talking. My husband said they were crazy and that he had my eyes given that I’m half Korean. As I look at my son today at age 3 1/2 I still sometimes can’t see the characteristics of ds but then I look again and there they are. I often think that since I don’t see them then no one else can and I feel the need to tell everyone he has ds. They will usually say “yeah I knew that”. I am always in shock. Anyways I love my son’s eyes, his split toes, and the fact that he can do a split better than anyone I’ve known! I guess not seeing him as any different makes me treat just the same as my other children but I know he just needs a little more help. I wish I had been more involved and aware of children with special needs long before now so that I wouldn’t have been so lost as what to do when my son was born. I enjoy reading all of your post and blogs everyday. I still am learning about ds everyday. I wish I had had a pediatrician that informed me of all the things that needed to be done such therapies and support groups but unfortunately I had to figure it all out on my own! I still don’t know if there were things we should have already done or should be doing or need to do in the future. That’s is why I make sure to check in with you guys everyday to see if there is anything I’m missing. So thank you so much! You are a blessing! I wouldn’t change my son for anything in this world either. The doctors told me I shouldn’t have any other children because my chances for having another child with ds increased dramatically. Well I became pregnant when he was 2 and all I heard was “oh no what if this baby had ds?”. I simply said “well that would be ok, I at least know what to expect and it’s not as bad as you think.” I enjoy my son everyday and I am so blessed to have him. My life has changed for the better. The things that I thought were important before are not the things I value today! Having a child with ds was the biggest blessing of my life and changed me for the better!!!!!!! So I was reading, and noticed Rick was being mentioned, and I was thinking”Whose Rick?” Why does Noahsdad keep mentioning Rick? At the same time I was thinking-“Is Noahsdad a Dr too,because the way this is written sounds like a Dr wrote it. LOL at me it didn’t click until I read”Rick and I fight about who gets to cuddle with Noah.”A lightbulb went off and I realized Noahsdad was Rick. Funny, I didn’t know his name, he’s Noahsdad to me. Noah is adorable, and has great parents! A wonderfully refreshing and honest article about Down Syndrome. It’s written clearly in terms that everyone can understand without ‘talking down’ to the reader or making them feel uncomfortable with confusing medical terms. We produce educational tools to help professionals and parents understand DS, including our range of dolls that help promote self-acceptance and self-education. Sometimes, it can be difficult to explain why DS needs to be discussed and accepted. Your writing does an admirable job at achieving both. This information is wonderful and I wish I would have had it when Grant was born!! Thank you both for all you do for the DS community!!! I just have one comment about upslanted eyes. Many people in my family have them. Mother and I looked around and found that her grandmother had slanted eyes and her mother. We also noticed that my uncle has them. My daughter has them Many of my nieces and nephews and grand children have them. They are obviously are a dominant trait. Not just in Down’s. 🙂 It’s been a lot of fun to look and see who all has them. Also my great nieces and nephews. What fun. Timothy is more like the others. Ask Noah’s Mom if there is a way to work with DS kids to help them to chew their food. Timothy is 22 and doesn’t chew his food well. The one thing we know for sure is that due to heredity he does not have a full set of teeth. He is missing about 12 permanent teeth. Still has baby teeth. I wish I knew ways to help with this but I am willing to bet a speech therapist who does feeding therapy could help you. Have you tried that? I would think the speech therapist at a rehab facility would be your best option as they work on getting people to eat after brain injury so they may have a few tricks up their sleeve. Your blog was a wonderful resource for me during my pregnancy and I want to thank you for being so candid with your posts. My son, Maddox was born in December of 2011 and did not have DS although our OB/G kept insisting that he was “positive” for DS. I am now working with doctors in our state to try to push that the misuse of this terminology be stopped in regards to blood screens and other risk indicators because I feel that this is scaring parents instead of helping them to prepare and find answers. I would like to add your guide to this discussion! Thank you so much for all you are doing to help parents! Hi. I just found out today that one of my daughter’s doctors want to have my daughter’s genetics tested. She is almost 2 1/2 years old and no know has said anything to us before now. I’m really upset. I just keep wondering if there has been something wrong this whole time why are we just finding out now! I don’t know if children with DS can only have part of the systems of if I’m over-reacting. She was born at 29 weeks and has had meningitis and she has a shunt. I have always noticed that she has a wide flat bridge between her eyes and that her eyes were set in just a little, but I always just thought that was just her. We’ve seen several different doctors and I’m just confused as to why they are just now saying something. She is in a program called First Steps because she was premature and someone came out to the house once a month. Now someone is still coming out once a month for regular visits, but she is also seeing a physical therapist two times a month for low muscle tone. I’m sorry I’m venting, but why are they just coming up with this now?! I love my daughter and wouldn’t trade her for the world, and she may not even have DS, but after the research I’ve done just this past hour I’m starting to see several different things matching up to it. I don’t know if you have any advice for me, but I would appreciate it. I just want her to get the help she needs if she does have a form of DS. After reading your posts, I remember that Hannah used to stick her tongue out when she was little. I wasn’t educated enough on DS to know that was even a trait. I’m really nervous now. I’m 36 weeks pregnant with our second child and I keep wondering if something is going to be wrong. We refused the tests for DS and whatever else they do with both of my pregnacies. We would keep them either way. I’m sorry for talking so much, but I’m venting. I haven’t told my mom or anyone, just my husband. Thanks for all the helpful information on this blog. I get told all the time how beautiful Hannah is. I just never would have thought she could have DS, but it does explain some things. I am going to make some assumptions but I am guessing that based on her needing a shunt she may have had damage to her brain from meningitis. With delays being able to be explained by other reasons (such as meningitis) doctors tend to not look for other reasons like Down syndrome. It sounds like she has the intervention that she needs so far which is fabulous and so important. Let us know what the results are. Your post is wonderful! I am a home birth midwife that loves reading about special babies. 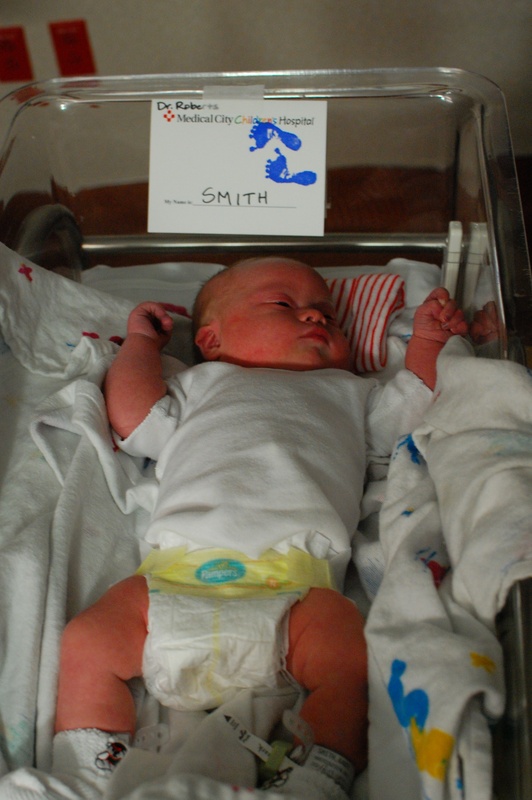 An acquaintance recently had a wonderful home birth and the midwife picked up on soft markers for DS right away. She left the family to rest that night, but returned the next day to encourage consultation with a pedi. Home birth is important. Bonding is imperative. I really think even more so in a case like this. To have that first few days of wonderful peace changes families. Any thoughts? I’m so proud of my nephew Richard. At the aged of 2 he already knows how to open his IPAD2, scroll, use the camera and takes photos of himself. Richard is amazing, very smart, loveable, cheeky , funny, talented and happy baby boy despite of his disability (DS). His favourite TV program is Baby TV that he normally watch. He loves yogurt. He is the love of our life. He brings so much happiness in the house because of his cheekiness. We love him so much. He enjoy shopping and going to the Mall. Richard is now attending school and love it so much and you wouldn’t think that he is DS. Hi, i need to know why are DS children struggle with bottle feeding? We also have a huge problem to relief the baby from winds, any suggestions? My daughter give birth to a boy 5 days ago and we need all the information that we can get. It’s the first time we ever deal with a child with DS. I am almost 24/7 in tears and really don’t know how to assist her or even help. I’m so hopeless at the moment. Please help me!!! !Are there any medicine that they need to take. We had to wait 3 whole days for genetic results of my son’s DS. His features are almond eyes, flat nose, no nose bridge, thick neck folds, and small ears. I am actually half Asian and was born with the eyes and nose so we thought there was a chance he just received a lot of Asian genes from me. But he did test positive. He is almost 2 weeks old now. We are fortunate as he is healthy, takes a bottle really well, has great muscle tone and is like a typical newborn. Since finding out we have gone through every emotion possible – good and bad thoughts. This is my son Colton at about 10 months old. I took him to a new doctor and the doctor believes he has Down syndrome. I have to take him to a specialist but it’s not until February. He has a crease on both of his hands that go straight across that was the main reason the doctor thought he might have it. His head measures a little bigger and his doctor said he has flat features on his face. What do you think can you see any symptoms in his face? I loved it . I also have a brother and he is the best thing ever! This might be inappropriate and if you don’t feel comfortable responding I understand. 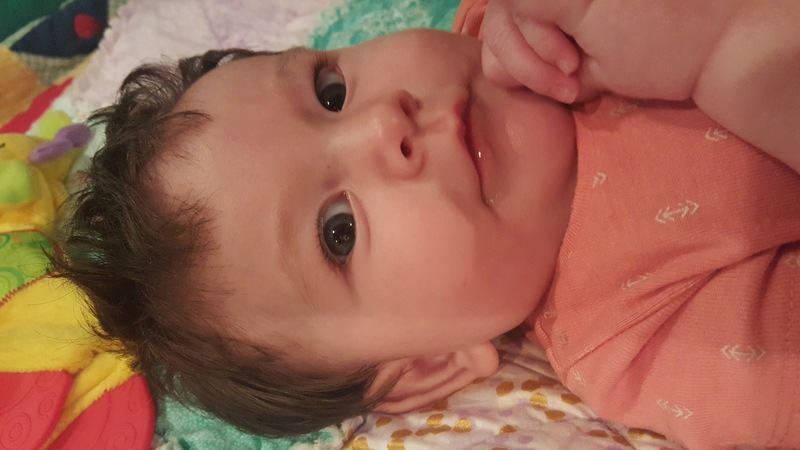 Butyou baby is 5 months old and the other day I noticed her eyes have the eye folds. Her nose seems flat too but it may just be because her nasal bridge is formed yet. When she was a newborn she stuck her tongue out some and still does from time to time. She has no other characteristics. She spent 2 weeks in the nicu and she is 5 months now and no one has mentioned anythinget of It. So I’m sure at this point I sound crazy. Buthe i was wondering if you think know maybe I should being it up with her pediatrician? She is growing fine and reaching milestones. Her eyes just worry me. She doesn’t have Down syndrome 🙂 She likely has facial features similar to one of her parents, but her features are not consistent with Down syndrome. I am wondering if University of Texas Medical Branch (UTMB) can use Noah’s newborn pictures in some of our medical and resident on-line training. In particular, the Neonatology on-line chapter, linked below. I just met my friend’s 2 month old baby and I suspect DS but she didn’t say anything. (Almond eyes, tongue sticking in and out, sleeping with both arms up). Should I wait until she says something first? How do I approach this sensitively? Hi there. This blog and all these comments have really warmed my heart, but my husband and I are still struggling with the not knowing right now. I probably had about 12 hours of bliss after my daughter was born, but when the Pediatrician came in the next morning, she mentioned some nurses at delivery thought she displayed signs of DS. All the medical staff was split 50/50 throughout our week in the NICU. Some acted like it was a sure thing, some assured us that they didn’t think she had it. A lot of the DS features are actually features of my husband and me. He has simian crease, wide toes and similar looking eyes to hers. She also had PDA, which kept us in the NICU for two days, and some other small heart abnormalities that run in my husbands family. We are waiting on the genetic test, but it has been so hard because we feel like we can’t stop wondering and worrying about her instead of enjoying her. It’s the most tears we’ve cried together in our whole relationship. I know we will have answers soon and then we can move on one way or another, but our hearts just hurt right now. All your lovely stories make me feel guilty for worrying that she actually does have DS. My in laws and myself, a little bit, have worked professionally with people who have DS, and I know them to be lovely people, but not knowing anyone personally that has children or siblings with DS, I just can’t imagine what our lives will be like. I am doing a project for my health class and I chose Down Syndrome. This blog gave me so much information about the topic, this story is amazing! Your son is adorable by the way:) !!!! Thanks for your comment, and good luck on your project! Hi! Congratulations on your new baby! 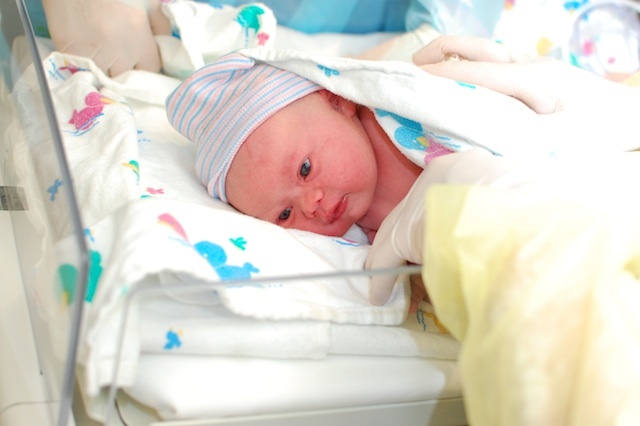 Has your baby been born yet? Where do you guys live? Hi rick, I live in Edinburgh uk. Yes he has been born. Thank you for the congratulations. I haven’t heard many of those, most of it’s just sorry…. Hi! I am about 22 weeks and 38 years old. I have been told by my Dr. that they found the T21 chromosome in my panorama test and that I am at 90% risk that my son will be born with this. My NT scan as well as my anatomy scan were all normal. I decided not to do the amnio because either way I want my baby and won’t put him at risk. My husband and I are still doing lots of research to prepare just in case. I was just wondering if you knew before your son was born through tests or scans if they were able to find the traits and markers ahead of time. Even though everything else so far has come back normal they are still telling us it is very likely. Congratulations!!! 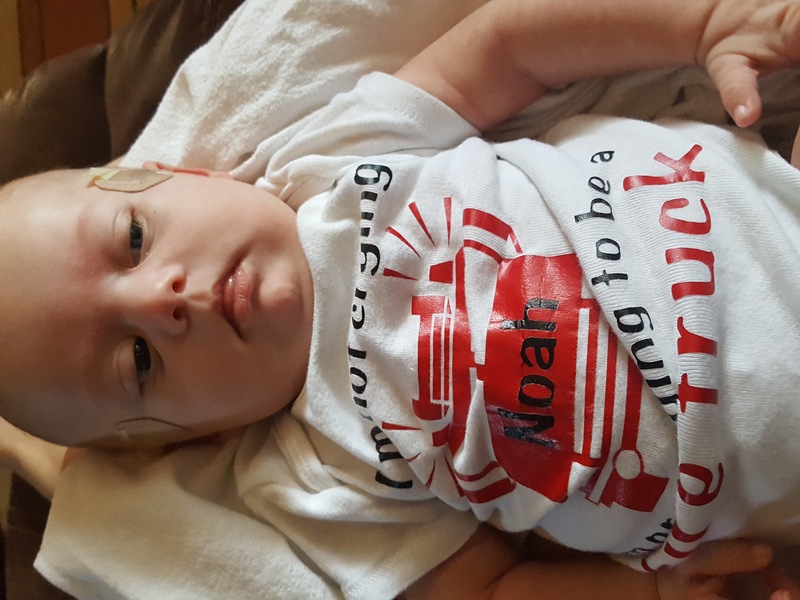 You can read our birth story on our blog as well but we did not know that Noah was going to be born with DS. We didn’t do any prenatal tests. His ultrasounds all looked great. We have a huge community on Facebook under Noah’s dad. And in that there is a group called parents of children with Down syndrome. I think you would find a lot of encouragement there if your child does have Down syndrome. I know the information can be overwhelming right now and it is a lot to take in. If you have any questions we are happy to help. I also have a little guy with down syndrome and his name is also Noah. I just wanted to say a couple things about my journey so far. When the Dr first tokd me the news I was so scared and honestly didn’t know how to process the emotions. I was relieved at first just because he could sustain life. We had a miscarriage just 4 months prior. Then I got angry and the two girls I went to nusring school with were both pregnant and having perfectly healthy babies. We found out at 13 weeks that he had down syndrome. Which was nice it gave me plenty of time to process and accept what was about to come. Then I worried about all of the possible medical issues we could be facing. It was all overwhelming to say the least. Them my little Noah came into the world at 35 weeks weighing a healthy 7lbs 15oz and 21in long. We spent weeks in NICU and the hypotonicity was a battle. He is still on oxygen and has congenital heart disease. The time we spent sitting alone in NICU was an tough time but I realized that I was wrong when I said life wasnt being unfair for giving him this. The universe knew just what it was doing. I NEEDED this little man just as much as he needed me. I feel privileged to have this little guy in my life. He deserves parents that are willing to give everything to give him the best opportunities life has to offer him. He will teach me more about love and life than I know. Im beyond excited to watch my little guy flourish at his full potential what ever that may be. He has already shown our family a new type of bond. He is our first boy and his three big sisters couldn’t be happier. Just know that it isnt darkness and horror. Its truely an amazing experince. I wish everyone the best of luck in the journey. Mine has been phenomenal.